A travel writing project by Alex Bulmer. Generously enabled by The Winston Churchill Memorial Trust. The young boy at a nearby table is petting Zeus. Not the Greek God, but the dog God. Or, to the point, my guide dog. I am blind. Not from birth but gradually, unpredictably and persistently since my early twenties. This enforced way of being is my most profound journey, a migration to a sightless culture within which I remain a seeing immigrant. Today I write. It’s late October 2014. I’m supposed to be in Berlin. Instead I’m at the end of my London home street of Rectory Gardens, in a small café called Bloomers Florists. They sell flowers as well as food, which explains the name. I walked in here, a sense of dread at the thought of sitting down to write. Usually I look forward to writing, eager to lose myself within an imaginary world. Not today. To find the words to express my experience in Germany, especially the final days, is hardly an escape of imagination. The child next to Zeus is now laughing. No, shrieking at my dog’s habit of licking. Zeus has many affectionate habits including spraining his tail from wagging it too much. My dog is pure Disney. 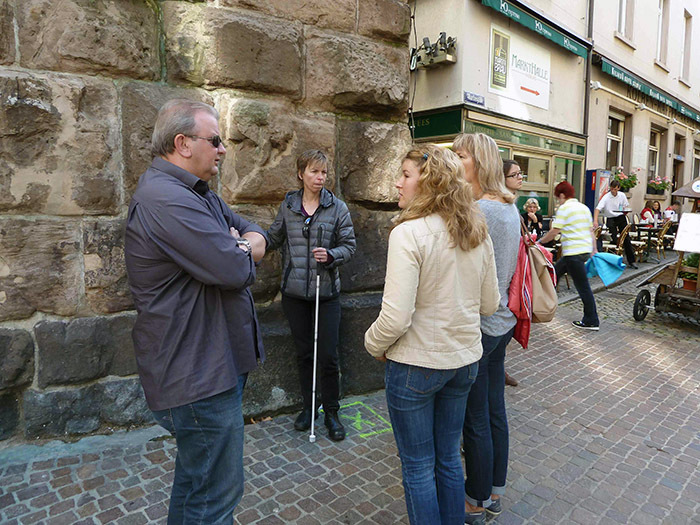 What’s it like to travel blind? The question came to me seventeen years ago, while visiting my dear friend Winkie. Some call her Michelle, but it’s far too mundane a name for such an original spirit. Winkie had encouraged me to leave Toronto, where I’d been living for ten years, and spend two weeks with her in Los Angeles. The offer followed my admission that losing my sight was getting the better of me. I was a mess. I’d stopped working. Stopped socializing. I felt trapped and afraid. Getting on a plane to L.A. sounded like the perfect solution or certain disaster. Everything fell into extremes at that time. There were no “could be’s” or “sounds pleasant”. I said I’d go. Then, I did the most illogical and extraordinary thing. I called an airport hotel in Los Angeles and booked myself in for two days. Not with Winkie, but with myself. Seemed to me that what I needed to do was try to travel, try to discover the world, on my own – travelling while blind. Toronto wouldn’t actually allow me to do this. I had seen Toronto. I had too many clues through sight holes that triggered memories. I was relying upon old images and felt I was hanging on to a perceptual rope that was fraying quickly. Without knowing it at the time, my instinct to go solo in L.A. for two days was to shed myself of the visual memories, the thinning rope, and try to grab on to a new way of being. That new rope was blindness. On my first day in L.A., I used my cane to find the hotel pool. Once in it, I realized I had no idea of its size, shape, or depth. Reaching out, I felt the wall of the pool and traced it, swimming round and round in order to comprehend its size and shape. The journey revealed details I would have never noticed with my eyes. I found cracks in the concrete, chunks missing, discovered filters and flaps. I noticed how the slap slap of water against the pool edge shifted to a gentler and hollow sound by the ladder. This changed to a slap echo slap beneath the diving board. I swam around and around fascinated by what I’d only ever thought of as water and walls. Eventually, I came to understand the pool shape was that of a kidney bean; round at one end and more narrow at the other. Suddenly, I existed in the pool. With a sense of its shape and sounds, I had enough sensory input to feel present. Now, fully being in its water, the last exploration was to figure out where it was deep and where shallow. A few bobs up and down filled in the information gap. It was a good half an hour to know the pool, and know that I was in this particular pool. I’d never “seen” a pool like this before and the adventure excited me. Going blind, as in going out blind, going swimming blind, going to L.A. blind, had its own time frame, its own particular detail, a continuous series of discoveries; pieces which add up to a whole. I’d become a sensory mathematician, a perceptual archaeologist. I decided I would one day write a blind travel book. Seventeen years later I had not honoured my decision. It was 2013 and I was now living in London England. I felt I had to understand more about my sensory status. My sight had degenerated further leaving me with only light and shadow perception. The travel idea once again took hold and I looked for any writing by anyone who identified as blind. With stunned delight I discovered James Holman, an Englishman who historian Jason Robert’s identifies as the world greatest traveller. Holman travelled the world in the early nineteenth century. He had become blind following a military accident and was then housed in an institution, with an allowance from the Royal family. He referred to it as his imprisonment. He left London, put his allowance at risk and set off, visiting, according to historical reference, all known lands inhabited by humans. His story inspired me. His writing, however, seemed strangely difficult to find. I learned, to my dismay, that much of Holman’s writing had been discarded and lost due to disbelief that a blind man could possibly observe and document the world with any accuracy or validity. That was it. I needed to follow in his footsteps. My plan developed. I would start in Germany, as one of three countries to explore. Using the Holman writing I managed to find, I elected to follow routes that he had travelled two hundred years earlier. I’d fly to Basel, then use trains to move through seven cities, ferry up the Rhine with the final destination of Berlin. Going alone with only my guide dog (Zeus) was just one stick tap beyond my adventurous limits. And Zeus would hate the trains. Holman had travelled with a companion. He usually chatted away the hours in caravans, and ended up with a mate to join him on his journey. I liked the notion of a human companion, but wasn’t up for trying to pull one using my charm in a non-English speaking country from a bus. During the week I spent with Winkie I continued to venture off on my own, cane in hand. I learned a valuable “foolish” lesson. Not doing a stitch of research, I set off through downtown Hollywood, and got lost. I found myself down a very rough, very unpleasant side street, and encountered a gang of young men. They took hold of me and attempted a mugging. I kicked my way to freedom, then ducked into a shoe store. There I remained for an hour and a half until Winkie was able to come to my rescue. That hour and a half gave me time to think. Of course this was foolish, but it was equally necessary to honour my adventurous nature. Would losing my sight mean losing parts of who I am? My spontaneity? My spirit? I thought of other things I’d done easily with sight. I remembered driving. My motorcycle was now gathering dust in my parent’s barn. Perhaps I could pretend it was just being fixed. I could say I still drive a motorcycle, it just happens to be in the shop – forever. These mind games continued for twenty years. London is covered in rubbish. I knew this prior to my airport journey, based on my guide dogs daily diet of half eaten burgers, discarded cupcake wrappers, crisp packets, chicken bones, crisps, bread and cake. But today being travel day from London to Basil, my dog is not with me. Instead I am travelling withmy friend, Michael, while my guide dog holidays with his aunties. As Michael and I pull our wheelie bags across the floor of Finsbury Park tube station, we manage to barely advance by five feet before needing to stop. I am thwarted every few feet by a half pack of biscuits, a box of Indian take away, wrappers, plastics, a sandwich box, all lodging themselves happily into my luggage wheels; and since I am holding on to Michael’s left arm, he too is halted by someone else’s lunch. As we near the steps down to the platform, Michael calmly suggests that perhaps next time one of us might try a backpack. The flight from Stanstead to Basel was easy and a mere hour and fifteen minutes. The only incident of alarm involved a cup of coffee. I’d been handed a large paper cup with a lid, and fiddled for some time to find the sipping hole. Unsucceful in my search, I gave up, lifted the lid and knocked it back. I then poked Michael and asked if it was possible that I might have a mouthful of coffee grounds. Michael looked at the cup and lid and alerted me to a filter which was built into the top. I assumed therefore, the answer was, yes. Sadly, from this moment in time, coffee lids now join the growing ranks of the unpredictables: public toilets, mobile phones, shower taps, corkscrews, life. The journey from Basel airport to Freiberg involved a relaxing taxi drive past what was described to be open spaces with mountains and trees in the distance. The car did not jolt to a sudden halt, swerve, accelerat wildly, honk or stall, nor did the driver at any point release any sounds resemebling profanity. The only words he uttered were “danke” and “auf wiedersehen” (thank you and good bye) I had very clearly left London for a whole other world. The taxi pulled up in front of our AirBnB, where, according to Michael, our hostess was waving. I stepped out and listened for signs of cars or bicycles. I could hear only occasional voices and a distant sound of happy chatting on patios. Feeling relaxed and safe to move, I stepped boldly into Freiberg without the aid of a guiding arm. Instantly, our hostess, Danielle, threw herself at me, warning me not to make another move . I did think this was simply due to her not expecting a blind person to emerge from the taxi. However , there was a much greater reason for being pinned to the car. Lining the streets of Freiberg are gullies called Bächles. They range in size from three inches wide to nearly three feet wide, all quite deep. Had I moved another inch I would have landed backward into a very deep gully. Thanks to Danielle, I did not. Danielle took us on an evening tour. She walked us through the maze of roads and lanes which criss and cross in all directions. The cobblestone underfoot was strangely comforting and therapeutic– perhaps because it felt less like a surface created for large automobiles and more interesting to the foot. I’d go so far to credit cobblestones as the originators of reflexology. Danielle pointed out a number of Freiberg highlights: the oldest hotel in Germany, the smallest house in Freiberg, several shoe stores, a wine tasting café, a brewery, the Dreisam river, top restaurants, the mosaics which lie in the streets outside every shop, . Most of this had little meaning beyond the fact that, for others, these things exist. For me, it was a list of words which were differentiated by a passage of time and distance. Two exceptions were the beer brewery which emitted a particular smell and the river. I gained a concept of the size of the river after walking over it on a foot bridge. I focussed on a general sense of the city. I felt an ability to perceive a distance in space due to the absence of traffic. Automobiles often create walls of noise that push against me; leaving me moving as if through a narrow tunnel. Freiberg on this Thursday evening was wide. That night, while getting to know my new bed and pillow, I felt a sadness that I’ve often felt once my surroundings change. I’d been given a menu to the city, list of provocations, a plate of words just out of reach, teasers. All would need time to transform into dimensional entities, and with time, a new reality, one with geometry, with scale and aesthetics , a place to inhabit, would emerge. I reached for the bed frame and felt strangely invisible, as if I was not quite yet present.